Grant, O Lord, that I may not be ashamed to confess the faith of Christ crucified, and manfully to fight under his banner against sin, the world, and the devil, and to continue Christ‘s faithful soldier and servant unto my life‘s end. Amen. O blessed Lord, who thyself didst undergo the pain and suffering of the Cross; Uphold, we beseech thee, with thy promised gift of strength all those of our brethren who are suffering for their faith in thee. Grant that in the midst of all persecutions they may hold fast by this faith, and that from their stedfastness thy Church may grow in grace and we ourselves in perseverance, to the honour of thy Name, who with the Father and the Holy Ghost art one God, world without end. Amen. O Almighty Lord God, who neither slumberest nor sleepest; Protect and assist, we beseech thee, all those who at home or abroad, by land, by sea, or in the air, are serving Christendom, that they, being armed with thy defence, may be preserved evermore in all perils; and being filled with wisdom and girded with strength, may do their duty to thy honour and glory; through Jesus Christ our Lord. Amen. Almighty God,Eternal Father, Lord of Lords, have mercy upon me, a humble knight in Thy Divine Service. Oh Lord,I pray for Thy indulgence & blessings. Forget not Thine servant in his trials,nor his Order of Knighthood. I pray, that Thy Will be done in all things, both great small. Let me always be worthy of Thee, let me not forget Thee in good times nor bad. Armor me with the armor of Thy Righteousness, give me the sword of Truth that I shall confound Thine enemies & be unto Thee a true knight. O Lord, in my hour of need, be with me. Let me never forget my sacred & holy vows unto Thee,that I should not be prey unto demons & devils nor the dark things of this world. Let me always be a beacon unto those in distress, never allow me to forget my obligation unto the homeless nor the poor, let me serve Thee & Thine Eternal Throne all the days of my life. Let me always remember the obligations that I have taken upon me. Lord,if it is Thine Will, let me serve Thee forever. If ever, oh Lord, I turn from Thee & this Order, let my name forever be cursed, may my spurs be broken & my body given unto demons to dwell with them forever in that Lake of Fire which Thou hast,prepared for the ungodly! Amen. O God, who didst will that blessed Mary, ever Virgin, the tabernacle of the Holy Ghost, should be presented in the temple: grant, we beseech thee, at her intercession, that we may be counted worthy to be presented in the dwelling-place of thy glory. Through Christ our Lord. Amen. May the grace of the Holy Spirit be present with us. 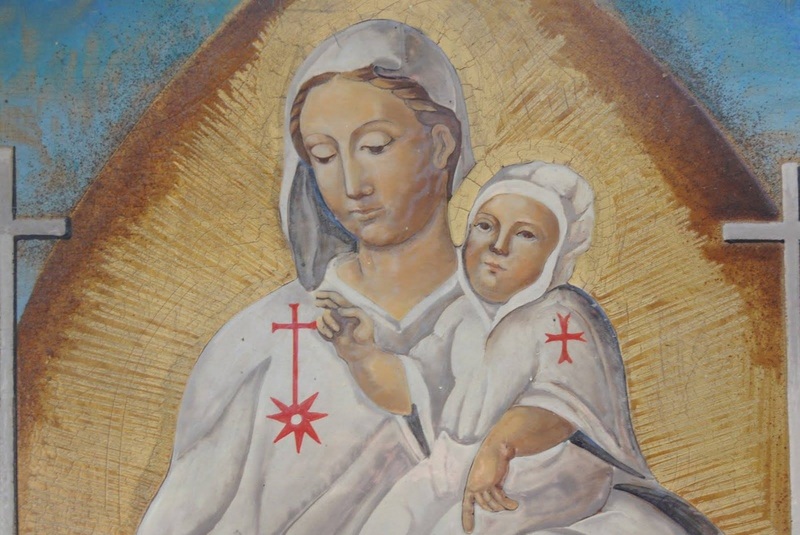 May Mary, Star of the Sea, lead us to the harbour of salvation. Amen. Lord Jesus, Holy Father, eternal God, omnipotent, omniscient Creator, Bestower, kind Ruler and most tender lover, pious and humble Redeemer; gentle, merciful Savior, Lord! I humbly beseech The and implore Thee that Thou may enlighten me, free me and preserve the brothers of the Temple and all Thy Christian people, troubled as they are. Thou, O Lord, Who knowest that we are innocent, set us free that we may keep our vows and your commandments in humility, and serve Thee and act according to Thy will. Dispel all those unjust reproaches, far from the truth, heaped upon us by the means of tough adversities, great tribulations and temptations, which we have endured, but can endure no longer. Omnipotent, eternal God, who hast so loved the blessed John the Evangelist and Apostle, that he reclined upon Thy bosom at the Last Supper, and to whom Thou revealed and showed the Mysteries of Heaven, and to whom, while suspended on the Holy Cross, for the sake of our redemption, Thou commended Thy most Holy Mother and Virgin, and in whose honor our Order was created and instituted; through Thy Holy mercifulness, deliver us and preserve us, as Thou knowest that we are innocent of the crimes that we are accused of, so that we may take possession of the works, by which we may be guided to the joys of Paradise, through Jesus Christ our Lord. Amen.